I’m tired of Nassim Nicholas Taleb. He isn’t as brilliant as he thinks he is. He may be a quant jock, but he talks about an idealized laissez-faire capitalism as if he’s never read a history book. Dude, this is the way the system works. This IS the system. The bubble bursting was not some unforeseeable event. It’s happened many times. Lots of people foresee it. They just don’t foresee the timing. That’s kind of my untutored feeling too. If an asset bubble followed by a banking crisis is a black swan, then black swans must be about as rare as black point guards. Our current crisis is bigger than most, but it’s hardly unprecedented. 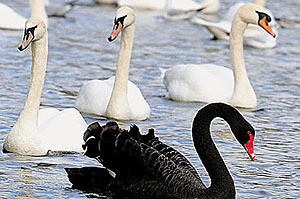 1) Due to a cognitive limitation, people tend to underestimate the likelihood of improbable bad events (‘black swans’). Therefore, you can out-bet the market by continually betting that bad events will happen….Taleb has even described the current crisis as a ‘white swan,’ and argued that it was totally forseeable. James Joyner makes the same point at greater length here. Consider me corrected.